Recommendations: Dan Graham’s “Rock My Religion” is an amazing video art/documentary piece from the MoMA’s collection but viewable online. It looks at ecstatic states in music festivals and puritan religious traditions. It highlights the way so much art has tried to separate the mind from the body and shows the power of experiences that reconnect these things. It also makes a powerful case for how art and religion can activate parallel kinds of overwhelming experiences. 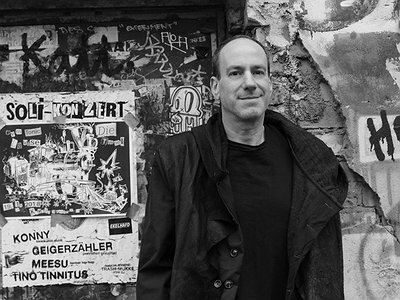 Website / Contact: If you enjoyed this interview with Joshua Fineberg, visit his official website for more detailed information and music from his extensive catalogue. I started music very young and at some level I always sort of thought I would be composing, though I probably didn’t understand what that might mean until I was in my early teens. It was when I was around 14 or 15 that I started to get a better inkling of how the things I wanted to make might fit together and I really started making work. As for early passions and influences, I remember being semi-obsessed with Jimi Hendrix’s “Electric Ladyland” and Boulez’s “Le marteau sans maître” at the same time when I was little. The intensity of Bartok or late Beethoven String Quartets and the visceral anger of The Dead Kennedys and the meticulous sound world of Pink Floyd were somehow all bound together for me and important to me in my teens. When I was 19 and had just begun to figure out what I needed to do as an artist, I met and grew close to Tristan Murail and slightly later Gérard Grisey who, especially in the early years of my career, were models for me of artistic brilliance, deep integrity, and originality. I was never drawn to style imitation in a conscious way. I think the conceptual side of my work became important to me precisely because it felt like it would force me out of the habits and methods I had been taught or seen in other-people’s work and make me discover something more personal. I try to put myself in situations where it will be impossible to use anyone’s pre-existing solution, even my own. This really started back in my second year at conservatory. I had just done a big, kind of academic-ish String Quartet that won some prize, but I remember feeling that I was writing more what I knew how to write than what I needed to hear. So, I started this big super-conceptual project where I placed all these constraints on the work that wouldn’t allow any of the solutions I already knew. This way I forced myself to try to build a new musical language almost from scratch. It’s not always this extreme anymore, but somehow this has remained my model. I will look at other people’s work but more to study the way their project interacts with listeners than for its actual content—and I’m just as likely to learn something from theatre, dance or visual art as from music. I take a reverse-engineering approach to music. I start with what I’m trying to accomplish, then try to work backwards until I figure out how to do it. I’m just trying to create the most powerful version I can of whatever experience and ideas I’m working with. As long as I’m the one designing it, somehow my voice will be there and as long as I’m true to the vision of what I am trying to make it will need to be different from other works. I used to think about perception all the time, trying to understand how things would be heard by someone not in my own head. This is a challenge since we spend so long writing pieces and are so primed to hear the things we’ve been thinking about in making the work. But now I’ve come to see it as less about exactly what one hears—though that still matters, of course—and more about what it does to the listener, how it affects them. This is difficult to master since it’s based on so many different factors, many of which we have little to no control over as composers. So, this has led me to think a lot more about the way pieces are framed, almost in theatrical terms, and the contexts they create around the things one hears. I think of successful musical experiences as a kind of consensual manipulation where the listener uses the composer’s work to change their internal states. As a result, almost all of my pieces in recent years have aspects that depart from the traditional concert framework in various ways trying to prime the listeners in ways that will help them have the kind of experience I hope to create for them. The key thing for me is having a good workspace for the old-fashioned giant score-paper and pencil work that can blend seamlessly with the technological side of my process. I have two studio spaces, one in Boston where I teach and the other in Berlin where I live when I’m not teaching. From a functional standpoint they are very similar – a big table for writing, a large computer monitor, Bluetooth keyboard and mouse, and a stand for my laptop so I can use it with both screens, good speakers (Neumann’s currently) and an RME sound interface. In Berlin the studio looks over the courtyard and in Boston it’s a little loft room with a roof deck opening off of it. I spend long stretches of time in these rooms so it is really important to me that they are bright places I can sit in all day without feeling locked in a cellar as so often happens in studios. I guess a good chair is the only other important thing. My schedule is really different in different phases of my work and depending on whether I’m teaching or not. I like to have long blocks of time, preferably the whole day. The morning is generally spent getting the work I’ve done so far on the piece really clear in my head, then when that’s done, usually late morning, I shower, eat something, and start working. This might be searching for material for a new section or refining things that I have already been working on. Once the piece is solidly underway, I often have quotas for how much I need to accomplish each day. Unless I’m behind on a deadline, I like to stop in the evening by 8 or 9 pm and then eat or go out and meet friends. My work tends to remain quite separate from my life while I’m making it. I’m really happy to go out and hear Techno and go dancing on weekends while working, but I’m hesitant to engage with music that has any resemblance to what I’m making (unless I have to with students). But, that said, my work is first and foremost about ideas and feelings which are completely bound up with the other aspects of my life. I like to lose myself in the world of the piece. I often try to bring it up in my mind just before going to sleep and let it swirl through my mind as I am drifting in and out of sleep. I think for me the real challenge is being concentrated and focused, but without trying to control everything going through my mind. This is why I need such a long time to sort of fully evoke the piece in my mind before I feel able to sort of wander inside of it and explore different options for how it could be and see how they feel to me … I use different prompts in my notebooks (text, pictures, actual bits of music) as reminders to help me get back to the place where the piece is present in my mind and can be worked on. I also use the computer models of the piece as a way of anchoring my imagination and freeing myself to play around with different solutions. "I try to put myself in situations where it will be impossible to use anyone’s pre-existing solution, even my own."